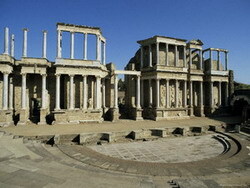 420 kilometres north of the Costa del Sol, in Extremadura, is the small town of Merida. It is too far for a day trip and in any case there is far too much to see in one day so try for one of the 50 Euro per night offers at the Medea Melia Tryp which is about 20 minutes walk from the centre of the town. Merida is remarkable in that its history dates back to Roman times and being in a remote, less well-known part of Spain, has not been developed to any great extent. Consequently there are still many traces of what was once one of the most important Roman and Islamic cities in the peninsula. Augusta Emerita was founded in 25 BC for retired Italian soldiers who had fought in the Cantabrian war. 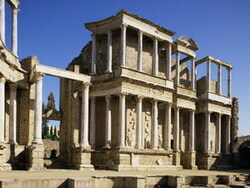 It was also intended to be the capital of the recently (27 BC) created province of Lusitania. Its location made it a communications centre where roads from Lisbon (Olisipo), Astorga (Asturica), Toledo (Toletum), Cordoba (Corduba) and Seville (Hispalis) all met. The Medea Hotel is an excellent place to start an exploration of Augusta Emerita. Even the hotel itself is built in a 'Roman amphitheatre' style and is alongside one of the main Roman roads that led to the city allowing us to march smartly down to the Roman bridge. 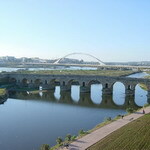 Recently pedestrianized, the bridge has been in constant use for over 2000 years. Repairs over the years have been in keeping with the original style and the majority of it is original. It is one of the finest examples of Roman architecture in the peninsular. Sixty arches carry the bridge across the river to the south gate into the city. On the right of the gate are the original walls. Those to the left have been demolished. It is easy to imagine the legionnaires breathing a sigh of relief after marching from Portugal with their destination in sight. Once in the city the choice of destinations is daunting. 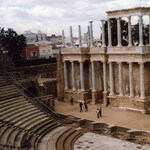 To cover the Roman period a visit to the amphitheatre and theatre is a must. The theatre is the best example of its kind in western Europe. Next to the theatre is the amphitheatre. Built in 8 BC it is also an excellent example with many of the passages below the seating still in their original form. The pit in the floor was where gladiators and wild animals were kept prior to their 'performance'. Many people are confused by the words theatre and amphitheatre, expecting the latter to be a semi circle and the former to be round. During the early part of the Roman Empire gladiatorial games to the death and pitting man against beast were popular entertainments. These took place in the round amphitheatre. Later, during the Imperial period, plays and music became popular and for these purposes the semi circular theatres were built. A visit to the Museum of Roman Art near the theatre is also a must. Here you can see the usual glass, coins, statues and other artefacts found during excavations but the two highlights are the fine mosaics, and the examples of Roman water technology. Some of the mosaics are huge and extremely well preserved. Romans were as class conscious as any other people and mosaics were used to impress friends and neighbours. The smaller each individual tile in the mosaic the more detail can be achieved with consequential increases in cost. It is the technology that really impresses. Huge bronze valves used to isolate sections of water piping for maintenance, valves to control the rate of flow of water and one-way valves. A detailed video, also available for sale, shows how the Romans understood and used water pressure to move water vertically as well as horizontally. Given a few more years they could easily have invented the steam engine. It is easy to realise how the uneducated Visigoths, who replaced the Romans, found the technology incomprehensible and thus failed to maintain it. 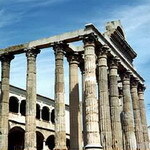 When wandering around Merida it is impossible not to notice other examples of Roman architecture. There is an arch, still in use, monumental aqueducts, bath houses unearthed beneath demolished buildings from a later era and many examples of original walls still used in current buildings. Breathtaking it may be but you still have to keep body and soul together. Fortunately there is no shortage of watering holes. Menu del Dia is definitely the way to go here and if you get the chance try the ham. Extremadurans claim their ham is superior to Serrano, and they are right. A favourite form of entertainment during Roman times took place at the Hippodrome or circus. The one at Merida is one of only three known in Spain, the other two are at Toledo and Tarragona. Built in an oval shape, over 400 metres long and 150 metres wide, the Merida circus could seat 30,000 people, almost the entire population. They were treated to chariot races, seven laps with no rules other than the winner was the first across the finishing line. Champions were venerated, there were no prizes for coming second and accidents were common. The chariots were as light as possible and pulled by two or four horses. They entered the ring at the start of the race via starting gates situated in a line at one end of the circus, very similar to the start of a modern horse race today, and thundered around the central platform that was called a spina. On occasion the entire circus could be flooded to enable re-enactments of naval battles. 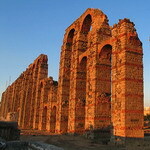 The huge amount of water required to flood the arena would have come from the aqueduct that passes the western end of the circus. This is the Acueducto de San Lazaro and it is impossible to miss it. The arches supporting the water channel march off for well over a kilometre towards the hills north of the city. Notice how at the circus end modern buildings abut the aqueduct. There are not many houses with a finer arch at the end of the drive than the one here at Merida. Recently excavated beneath the aqueduct is the site of a public baths area and a sports area, a Roman desportivos. Walking back into town you will next arrive at the Casa del Anfiteatro that is a whole site in its own right. The south section of the aqueduct emerges here and there is a water tower with a house alongside. Inside the house you will find some wonderful mosaics. From there it is a short walk to the south end of town, near the bullring. You will come to a site called Columbarios, which is a Roman cemetery. Two of the vaults have been identified as belonging to the Julius family and the Voconius family. The cemetery would have been situated outside the city walls as was customary at the time. The epigraphs and portraits have survived. Leaving the cemetery you will arrive at the Casa del Mitro. This was a large villa also situated outside the city walls. Some wall decorations and mosaics have survived along with the foundations, an extensive bath house and a huge underground water cistern. To really take away an idea of what life was like around the 1st century AD then a visit to Moreria is essential. This is a 12,000 square metre site behind the city wall alongside the river north of the Roman bridge. Originally it was an urban area, the houses, large and small are there to see, with a section of the east west main road through the town. It is easy to imagine this bustling street with covered arcades on each side housing shops and taverns. Four minor roads lead off and penetrate the city walls to give access to the river. This site is particularly important for revealing a continuous history of occupation from Roman, through Visigoth to Moors and then Christians, each leaving their layer for us to find. 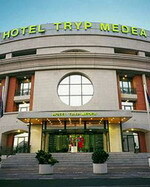 The Tryp Medea hotel is located in the area surrounding the old Roman bridge, an obligatory stop in the Silver route. Close to a shopping center. The building, in semicircular shape, is similar to a Roman Amphitheatre. 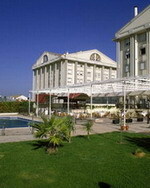 Restaurants and bars: Breakfast buffet (from 7.30am to 10.30am), Bar (open from 10.30am until midnight). Room Service and Wireless Internet Access in common areas (additional charge), Air conditioning throught the building and parking. Outdoor swimming-pool open in summertime. 103 Standard rooms. 23 Loft rooms of superior standard, situated on the 4th floor, equipped with a whirpool, spacious terrace, free newspaper and mini-bar. The Hotel retains the structure of the former 18th century convent, built over the remains of a temple to the Concord of Augustus. 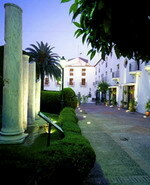 It offers guests an opportunity to enjoy the rich heritage of the lovely city of Mérida and the landscape around it. Some of the most outstanding spaces are the hotel lounge in the former convent refectory, the interior courtyard and the beautiful gardens, including the “Garden of Antiquities”, an archaeological collection consisting of Mudejar, Roman and Visigoth elements. Taste the exquisite local dishes, including caldereta (lamb stew), assorted gazpachos, figs from Almoharín and naturally, truffles.